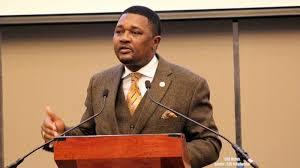 The Zimbabwe Anti-Corruption Commission (Zacc) is on the hunt for former Foreign Affairs minister Walter Mzembi and other ex-government ministers over the disappearance of over $1 million from donations that several companies made when the country hosted the United Nations World Tourism Organisation (UNWTO) in Victoria Falls in 2013. Yesterday, Zacc commissioner in charge of investigations Goodson Nguni told the Daily News that they now have evidence against Mzembi. “We have been looking for him since last Friday, he said he will hand himself over today (yesterday)”. “We are also looking for the chairperson of the Gender Commission Margaret Sangarwe (former permanent secretary in the ministry of Tourism) but she fled her home when we arrived there. We know that she is in Harare and we are still looking for her. We took the car she got during UNTWO and it is at our offices. Mzembi has also promised to bring the other car,” said Nguni. Since Mnangagwa assumed office on November 24 last year, several former government officials, mostly from the vanquished G40 faction, have been hauled before the courts on corruption charges. None among the current batch of ministers and those who were in the victorious Team Lacoste faction have been charged. Recently, Nguni said while Zacc’s hands were previously tied during Mugabe’s reign, the anti-graft body was now working without interference under the new dispensation, which has declared zero tolerance to corruption. Zacc has dominated news headlines after orchestrating several arrests of high-profile politicians and business people since last December when a new era dawned on the country. Sources at Zacc told the Daily News that the anti-graft body has also engaged border authorities to ensure that none of the targeted ministers — some whose cases are still pending before the courts — skip the country. According to the Constitution, Zacc can among other things direct the commissioner-general of police to investigate cases of suspected corruption and also refer to the prosecutor-general matters for prosecution. Sources privy to the investigations said Mzembi and Makombe, working with one Sharon Musarurwa and a Mushoriwa, received money from several companies around 2013 in the name of government but diverted it to their own use. According to the sources, Mzembi, who is also facing charges of abuse of office also wrote a letter to several companies, including Mbada Diamonds. Woes are mounting for Mzembi who is due to return to court later this month to answer to charges of abusing his office. According to State papers, sometime in 2010, the ministry of Tourism and Hospitality in its bid to introduce Fan Parks for the 2010 World Cup in South Africa, initiated a motion to acquire LED Public Viewing Area televisions for the public nationwide. Allegations are that in its bid to get the screens, the ministry applied and obtained funds from Treasury for the purchase of 40 screens amounting to $2 million. The court heard that the money was deposited into Shanghai Linso Digital Technology Company’s China account as payment for the equipment. It is alleged that the 40 television screens were delivered and received from China by the ministry of Tourism and entered into their asset registry. “Accused (Mzembi) criminally abused his duty by intentionally and unlawfully disposing State assets namely 16 PVA television screens by means of donating, loaning or hiring them to various institutions and church organisations without approval from the ministry of Finance. “The PVA screens are still being possessed by the various institutions and church organisations and are valued at $800 000. Government assets are not loaned to private parties. They are not donated, hired or transferred to other entities without authority from Treasury,” read part of Mzembi’s charge. On the other hand, former NetOne boss Reward Kangai and other top company executives are also facing charges of having defrauded the parastatal of a whooping $11 million through the selling of airtime and SIM cards. Kangai, allegedly owned Firstel, a company that was providing services to NetOne and still owes the parastatal $11 million. In 2016, NetOne chairperson Alex Marufu told the State-controlled media that most of the problems that the company was facing emanated from the incestuous relationship that existed between Firstel and NetOne. “I must point out an area of concern. A large part of our debtors actually sits with one company and that company is actually owned by the previous management team in their individual capacities. I have a problem with it from a corporate governance perspective, which is why the board is coming and looking at this and saying this possibly cannot be right. The amount that we are owed is as a result of management’s ownership in a company called Firstel,” said Marufu. Meanwhile, former vice president Joice Mujuru’s spokesperson Gift Nyandoro is also facing arrest by Zacc over yet unspecified reasons. Nyandoro told the Daily News that he would hand himself over to authorities.